Mungo Martin House - Historical Places of Victoria, B.C. While relatively new in the long run, the Mungo Martin House is a timeless feature in Thunderbird Park, possessing details of history and tradition that go back thousands of years. 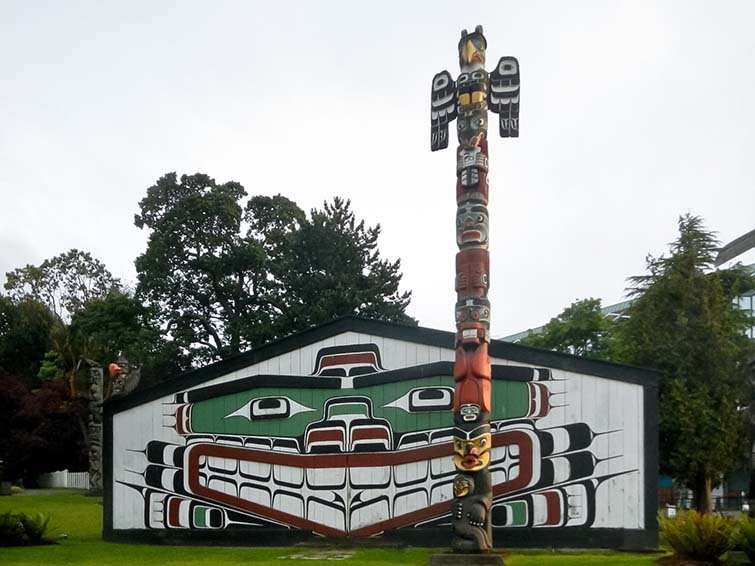 Built in 1953, the Kwakwaka’wakw big house replaced a previous inauthentic and inaccurate Northwest Coast style house that was featured when Thunderbird Park was first constructed in 1941. Also known as Wawadit’ła, the Mungo Martin House poles bear Nakapankam clan crests and the house is a smaller replica of the famous big house of Chief Nakap’ankam in Fort Rupert (Tsaxis). Born in Tsaxis as well, Mungo Martin had inherited the chiefly name, as well as the right to display his heritage’s traditional carvings and build the big house. Despite some modernized features, the big house maintains authenticity in its design and style of construction. Finely finished logs create the framework of the impressive building and cedar walls and roof planks are attached. The central hearth releases its smoke to the world through the smoke hole in the roof whenever the house is in use. 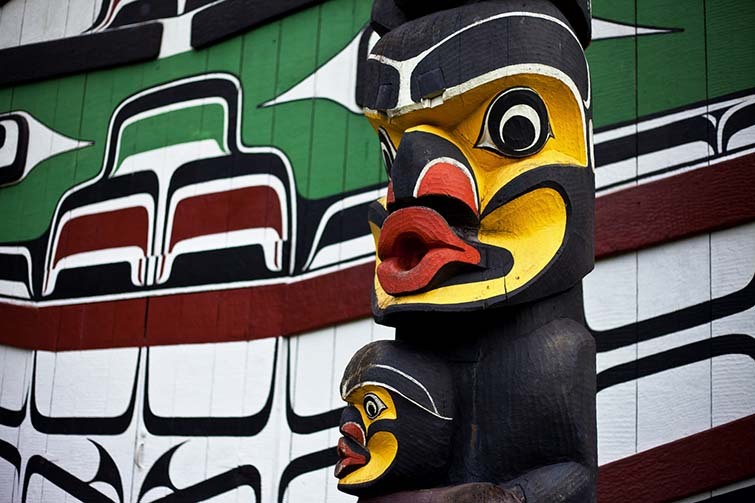 Considered to be the finest Kwakwaka’wakw carver of his time, it will come as no surprise that the World’s Tallest Totem Pole, located in Victoria at Beacon Hill Park, was also carved by Mungo Martin himself. While the house rests in Thunderbird Park, Wawadit’ła was considered the property of Mungo Martin. The opening ceremonies of the house took the form of a large potlatch, the first legal public potlatch since the government ban in 1889. Traditionally, potlach ceremonies establish the owner’s rights to display and use the hereditary aspects of the house, like the house posts and traditional carvings. After his death in 1968, the traditional hereditary rights were passed on to his grandson, Chief Oast’akalagalis ‘Walas ‘Namugwis, also known as Peter Knox. Today, new elements of Kwakwaka’wakw tradition reside in the house: a log drum and a dance screen. With the permission of Peter Knox, Wawadit’ła is still in use for First Nations events and celebrations, such as the 50th anniversary celebration in 2003, which took place in the form of another grand potlatch attended by both indigenous and non-indigenous dignitaries. Paying a visit to the Mungo Martin House is stepping into the living traditions of the Kwakwaka’wakw people. The architecture, dances, carvings and features of Wawadit’ła have existed for thousands of years, kept alive today thanks to the legacy of Mungo Martin. Not only was he an incredible carver, as made obvious thanks to the stunning totems and big house, but he was also a singer, story teller and teacher of his crafts and knowledge. He was an ambassador of Kwakwaka’wakw culture and history, and the mark he left all over the world with his art helped renew pride and knowledge of his people’s heritage. During his time at University of British Columbia as part of the totem pole restoration program, Mungo Martin recorded hundreds of traditional songs and oral histories – a priceless part of his people’s history. So, while the building may be new, the concepts contained within its various elements are key to the ongoing heritage of British Columbia’s foundations in the Kwakwaka’wakw people, and First Nations culture.